Through a conductor, students investigate Ohm's Law, the factors that affect electrical currents, and the resistance coding system. The lab is aligned with the College Board AP Curriculum. 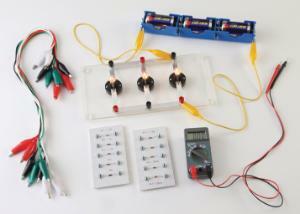 It includes instructions and materials for up to six students per lab group. Ordering information: This kit includes two circuit boards made for easy connections, a three-socket bulb holder, a three-battery pack holder, wires, and a multimeter.